This icon commemorates an event which gives a deeper understanding of the Virgin in relationship to the Church. In a.d. 911, there was an all night Vigil at the Church of the Mother of God in Blachernae (in Constantinople) which many people attended. Among them were St. Andrew the Fool for Christ and his disciple Epiphanius. To these two were granted a vision of the most holy Theotokos standing in the air, surrounded by choirs of saints. She lifted her holy hands in prayer, her veil stretched out between them, as if protecting the faithful beneath her with her holy veil. 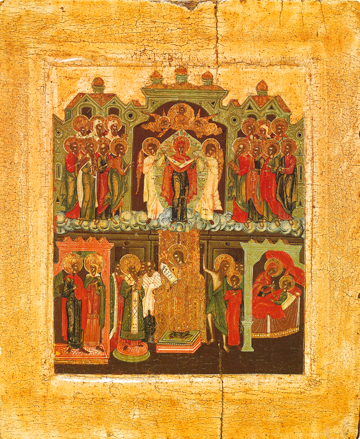 On top in the clouds in this icon is the Theotokos with angels around her and surrounded by saints on both sides, her hands stretched up in prayer for the world. Below we see those whom she is protecting; the king and queen, the hierarchs (representing the Holy Church), and the sick. In the bottom center, standing in the pulpit, is St. Romanos the Melodist (sixth century) who is also commemorated on this day. Just right of center when you look at the bottom of the icon is St. Andrew in his usual lack of clothing pointing out the vision to Epiphanius.